October 13, 2014 – Hyundai Motor’s ‘Shadow Art’ has been included in the Guinness World Records, the global authority on record-breaking, as the largest shadow projection in the world. The gigantic urban installation art was created to honor soccer fans’ passion for the most popular sport in Brazil during the 2014 FIFA World Cup Brazil™. The installation, consisting of HB20 miniature cars, created a big shadow in the shape of a soccer player, reaching 15.7 meters in length and 8.09 meters in width. 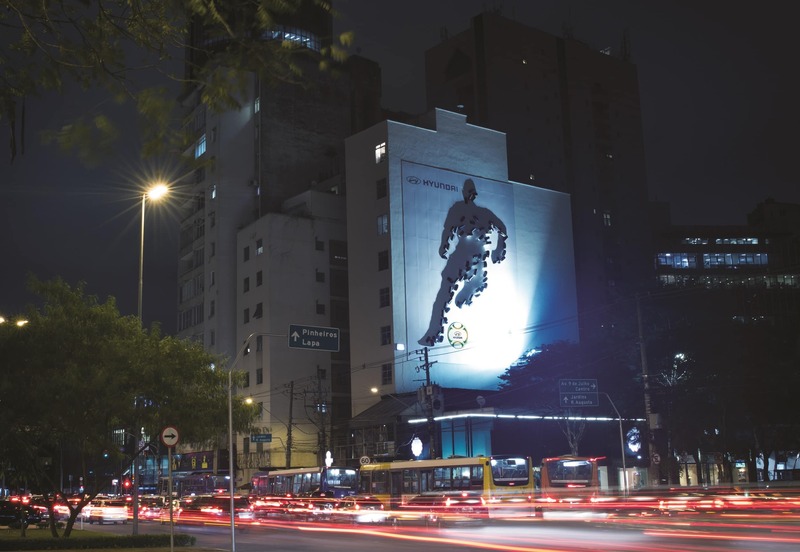 The hundreds of cars were attached on the building wall in Itaim Bibi, a central area of Sao Paulo, and during the night, the combined shadows of the cars produced the image of a soccer player dribbling a ball. With the participation of Eduardo Srur, the country’s famous visual artist, it took over three months to complete the work, as various factors had to be carefully researched and tested, such as the optimal size of the cars, position of the work, types of light, materials and so on. Several 3D simulations were also conducted to finalize the design. The work will later be donated to a local institution promoting soccer. Through its successful sponsorship of international football, Hyundai Motor has significantly boosted brand awareness and brand image. Since Hyundai Motor signed the agreement in 1999 to sponsor FIFA competitions including the 2002 FIFA World Cup Korea/Japan™, the company has successfully served as the official partner of 2002, 2006, 2010 FIFA World Cups™ as well as many other FIFA tournaments. In 2010, the company extended its strategic sponsorship agreement with FIFA to cover the 2018 and 2022 FIFA World Cups™. Established in 1967, Hyundai Motor Company is committed to becoming a lifetime partner in automobiles and beyond. The company, which leads the Hyundai Motor Group, an innovative business structure capable of circulating resources from molten iron to finished cars, offers top-quality best-sellers such as Elantra, Sonata and Genesis. Hyundai Motor has eight manufacturing bases and seven design & technical centers worldwide and in 2013, sold 4.73 million vehicles globally. With almost 100,000 employees worldwide, Hyundai Motor continues to enhance its product line-up with localized models and strives to strengthen its leadership in clean technology, starting with the world’s first mass-produced hydrogen-powered vehicle, ix35 Fuel Cell.